“When I walk through wilderness, I become really poetic. I do not say these poems out loud, I only rehearse them in the privacy of my mind. I was never really poetic before, but I found my poetic side listening to the soothing sounds of the tweety birds, the wind, and the distant mooing of the black angus. Before the campout, I really never bothered to listen to my surroundings. I never was in touch with my really soft side, and I never thought that I was poetical. 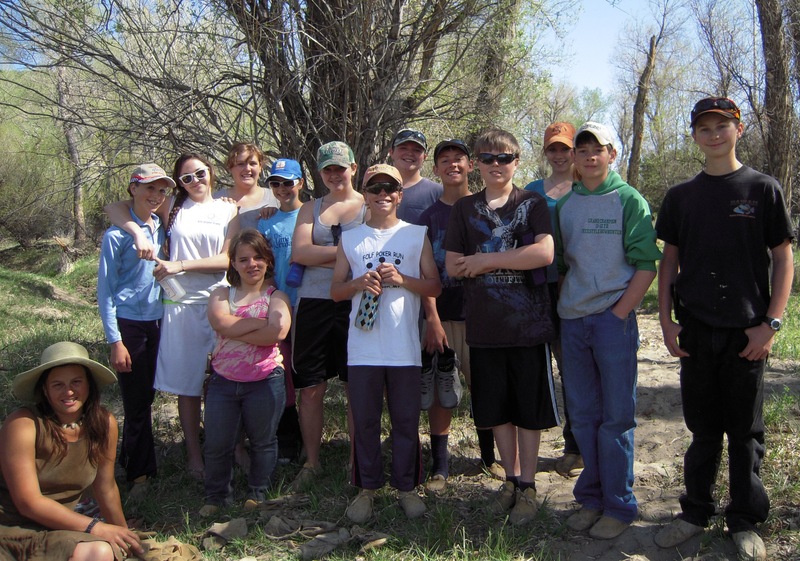 You can learn a lot about yourself when you venture through nature.” -Makenna L.
Today’s young people are shuffled from one event to the next, without time for introspection, exploration, or self-discovery. When a moment of inactivity comes, they are taught to turn on the television, fiddle with their cell phone, or check Facebook. But take away the clock, electricity, and society’s expectations – even for only a few days – and they open up with astonishing depth and passion for nature, learning, and life. “A plant that I found useful is the mullein plant. The thick soft leaves, when boiled, make a good tasting tea. The second year that the plant grows, it has a stalk that is very useful in many ways. 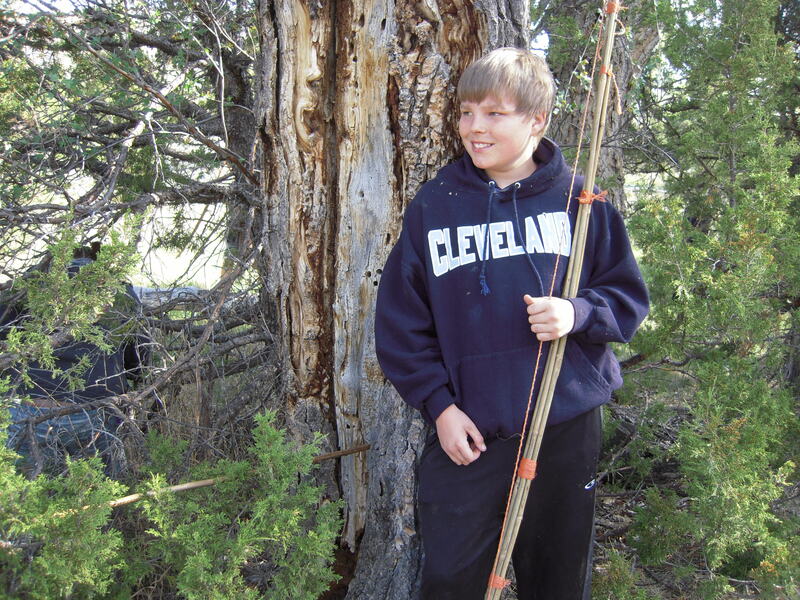 The stalk can be used to make arrows, atlatl darts, bundle bows, and handdrill pieces. The seedhead on the stalk can be used as a torch if dipped in beef tallow.” -Doug C.
“Mullein was used often on the campout. 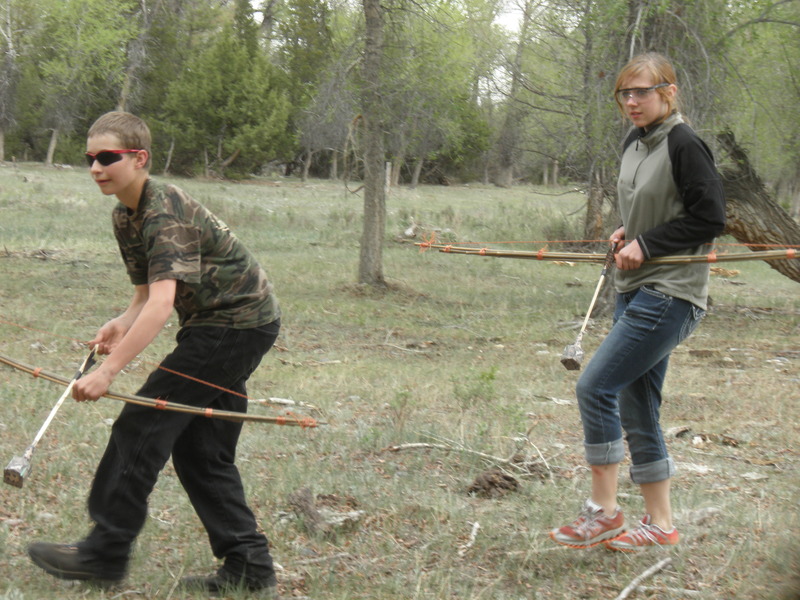 We used it for making arrows that we could shoot at nature targets. The arrows had to have a root tip on the end so it could fly straight and far. I learned that the mullein arrow flew farther if the stem was thin and light. Mullein was also used to produce tea that we cooked on the fire. It also makes really good kindling.” -Derik D.
“It is amazing how you can just use a piece of firewood and a few coals, then it creates a bowl. You get the chunk of wood and chop it in half, then get some very hot coals going and when they get done, put a few of them in the center of the bowl and get a blow stick. You can use a weed with a hollow center, so then you can blow through that on the wood beside the coal where you want the bowls to be on the wood. This whole process takes about one hour.” -Jakob N.
“Making the burn bowls was meaningful to me because it is so easy to do, and they will last a long time. They are made for many great uses. It was also meaningful to me because they are made in such a clever way, and I would have never even thought of it. I loved the easy process of making the burn bowls, and I also loved the finished product.” -Alexys B. “The cattail plant is a very interesting specimen. 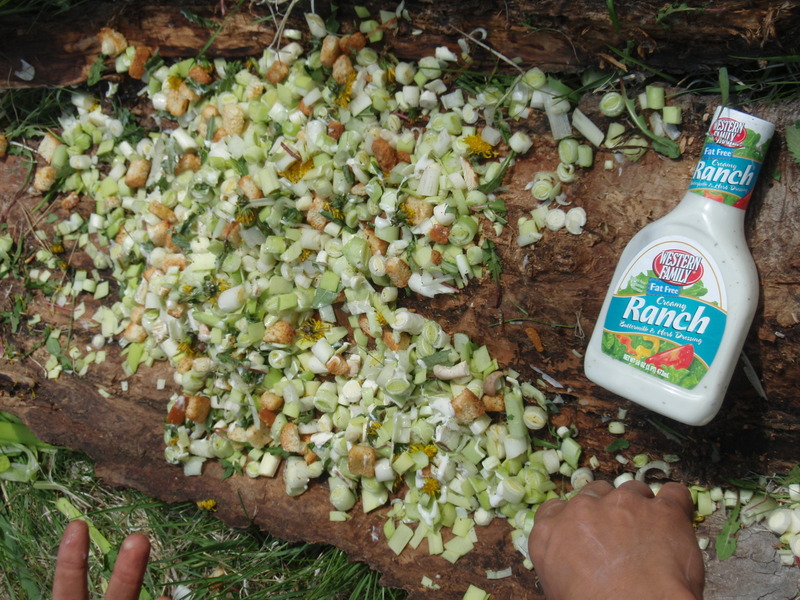 On our second day we had freshly picked cattail roots, wild ranch, and wild croutons. It was really yummy! The cattail has deep roots that go far into the muck of the swamp. You have to really pull sometimes! I found out something very interesting about the cattail plant. The roots seem to be connected in one big circuit. Maybe not with every plant, but I pulled up one and ended up getting three plants that were connected. I also found out that when you cut the cattail near the bottom, a really cool design is made. The outer layers of the flat leaves are hard to cut. The are very sturdy. I chose this plant because you can eat it, and you can also use the leaves to cook in a steam pit.” -Makenna L.
“Before the campout, I saw a cattail and said, “There’s a cattail.” After the campout, I saw a cattail and said, “Food!” I take notice of plants instead of just passing by them. Trees and other plants can make good shelter and keep you dry. I also stop and listen to the bird songs. I stop and close my eyes to listen. Their songs are different from day to night. At first I was scared to sleep in the wikiup. On the second and third nights, I liked sleeping in the wickiup.” -Josie H.
“We made bows and arrows out of bamboo and twine. Mine broke, so we had to make adjustments. I think that our ancestors had to make changes to make a reasonable bow to hunt with. We did not hunt with our bows. We had enough food, but we did stalk trees with them and practiced our aim. If we had run out of food, I believe that we could indeed stalk and shoot something with our modified bows. Our ancestors gave us skills that humanity still uses. They probably modified those skills and techniques, and we have thrived by using those skills and techniques. 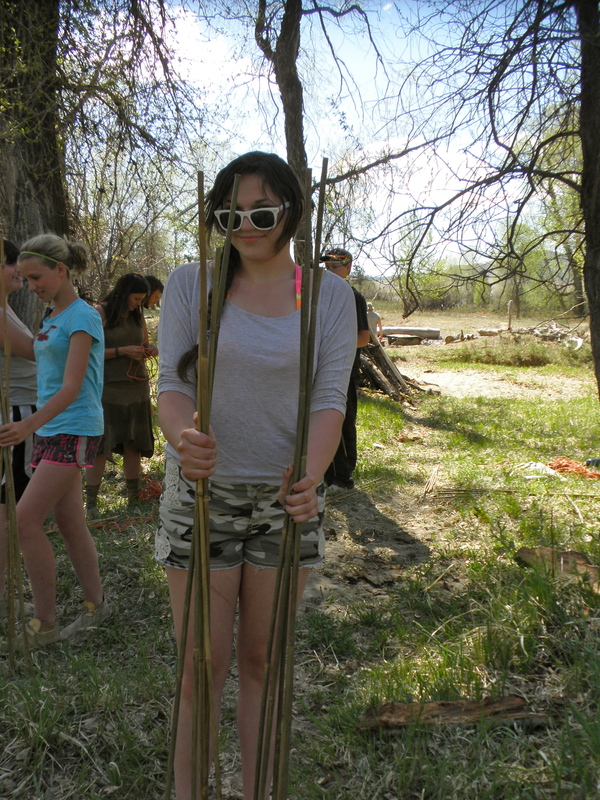 Thank you, ancestors.” -Makenna L.
“Using knots to lash multiple pieces of wood or bamboo together was difficult, but with the help of a partner, I managed to make a bow. A lot of experimenting went into trying to shoot string, and make arrows. Practicing shooting the bow and arrow will help me later in life by allowing me to make good shots with a bow to provide food for my family and me. 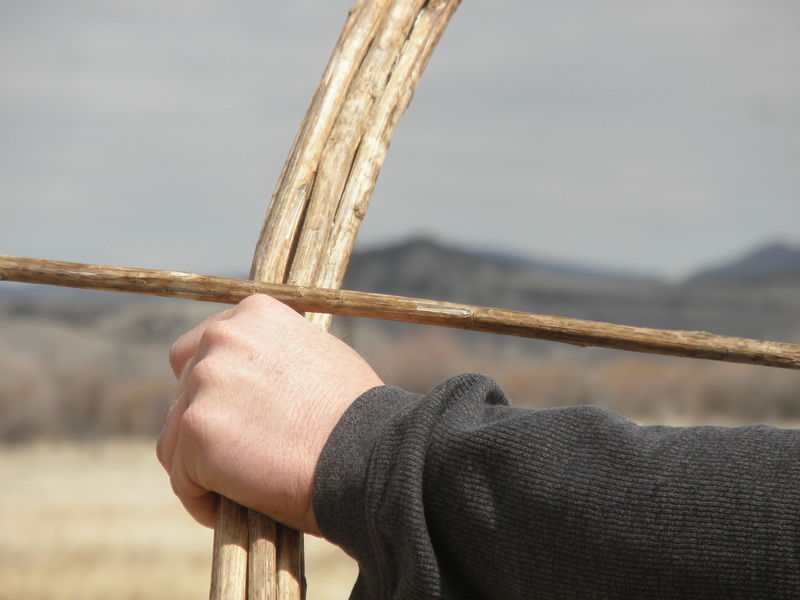 The foam-tipped arrows and the bow wars helped develop the skill of shooting moving targets and being able to shoot on a moment’s notice. Making arrows out of willows was interesting because the wood is stronger than mullein, and it can be used for hunting big game. I learned many new skills that will be with me for the rest of my life.” -Doug C.
“I used to think that birds were annoying, trees were a waste of space, and nature was just ridiculous. After our four day campout, I have a new perspective. I have realized that all those plants have a purpose, and that nature does too. You can use the plants to make a bow string and a bow! You can also use plants to make tea and to make kindling for a newly-made fire that started from the hands of friends and the branch from a willow. You see, plants have many uses, and I have a new perspective on nature and plants.” -Makenna L.
“I have a different perception on nature and wildlife and have better knowledge of them. I have learned to watch around me and pay attention to the minor details. There are a lot of different skills I learned, like learning how to make a bow and arrows out of natural materials and different techniques of hunting. I learned how the Native Americans hunted and what they gathered and now have a different look on the way they were.” -Kali C.
“I learned that you don’t have to be some sort of expert in order to know and identify the different types of plants and animals. This camping trip has changed me by teaching me how to use many different aspects in nature. It also taught me that everything in nature has a purpose and a use – no matter how big or small that thing may be. 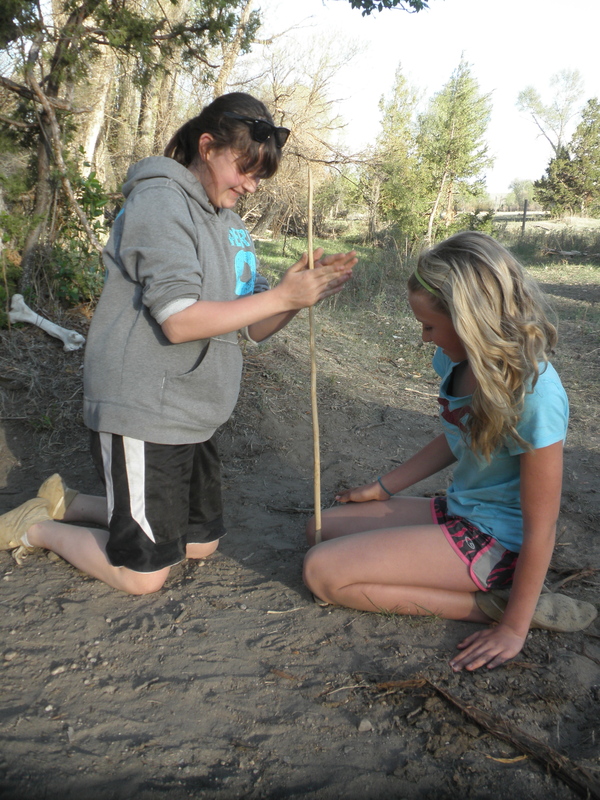 This camping trip has definitely inspired me to teach others about nature and its value.” -Alexys B. “The campout changed me personally. I’ve become much more of a nature person. Before we started getting ready for the campout, I did not know much about plants. I did not have many skills for being outdoors in the wilderness. I have learned how to identify different kinds of plants. I’ve become more comfortable being in the wilderness. I’ve become more aware about different kinds of animals. I learned how to be more quiet to listen for dangerous animals. I also learned the different alerts from the birds.” -Matthew S.
“Stalking was something that I really like to do and seem to be not too bad at. I like to sneak up on somebody, shadow walk them, and keep them from knowing that I am behind them. I also learned that I could trust myself out in the woods and be able to stay alive for a couple days. 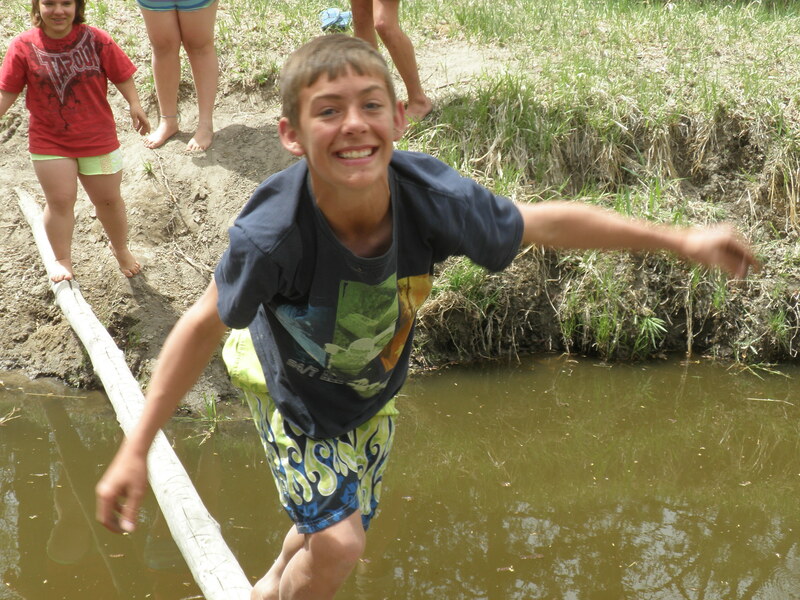 I learned that I sleep well in the outdoors , which would help me stay alive.” -Lane B. “The stalking games we played were meaningful to me. I learned how to use more of my peripheral vision and use my ears to hear what is in the trees and the area around me. I can be very quiet and try not to disturb the birds so they do not make an alarming sound. The birds warn the other birds and animals of danger. Fox-walking can prevent this alarm from happening, so it does not scare the critters we are stalking.” -Derik D.
“My most memorable experience had to be the marshmallow war. It was amazing getting to talk to Kenna and eating all the marshmallows. From the beginning, Kenna and I took our flag and went in a tree and just talked for awhile. Kris came, and then we ran out of there as fast as possible. We made it out. We ran and ran, but Kris caught up and got the flag from Kenna. The next game I took the flag and had Derik as a bodyguard, but then he got attacked. I ran for like a mile thinking I was being chased, but Sam was the other team’s flag person. Everyone went after her so I was running for like a mile with no one behind me. Awkward!” -Shelbi L.
“We all had positive attitudes about everything, even when it rained. Nobody wanted to go back to the wickiups. 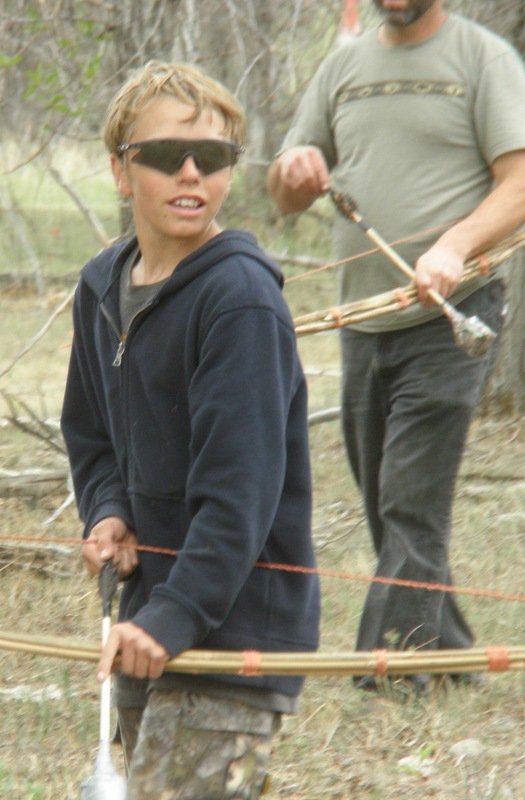 We all wanted to work on the arrows for the bow and arrow war the next day.” -Zach J. 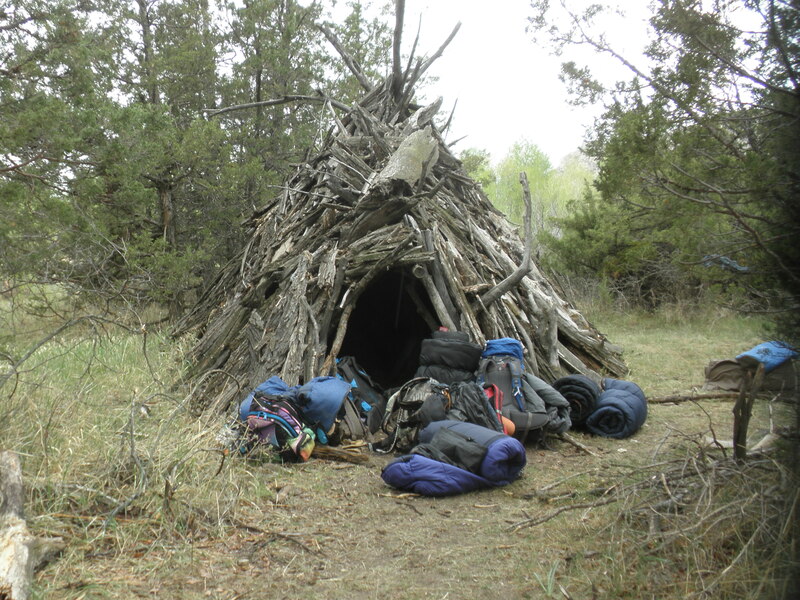 “It rained a lot, and we all had to go into our wickiup. The girls first were cold. We changed into our PJs, crawled into our warm sleeping bags, and we snuggled really close. We talked some after we warmed up enough to speak. We talked about who we liked, what clothes we would and would not wear, our favorite moments at the campout, and heck, we messed around some, too. We were pretending that we were zombies eating the brains of a captive. Then I was a sunflower being planted into my sleeping bag, and then I bloomed!” -Makenna L.
“Staying there for a couple of nights has shown me that instead of being what people make of you, you can just be you. That is why when you go and hear birds singing, or you see deer feeding, you noticed that they did not have peers to change them. They grew up as themselves, and that makes me think about our society. So, if you happen to want a day out of this life, or a day of peace, go to the camp out and find the inner you.” -Samantha T.